What’s more American that a burger and fries? Well, perhaps I can name a few things but, a burger and fries is pretty rocking. After all, the burger was created in the good old USA and American’s perfected fries. 4th of July Weekend, we took Taylor to the shooting range for his birthday. After finishing, it was time for dinner. We were in Downtown Ft. Myers and decided to try a local staple – Ford’s Garage. I had never been before but, Americana was the theme and Ford’s – focusing on burgers & Ford’s – was just the place for us. 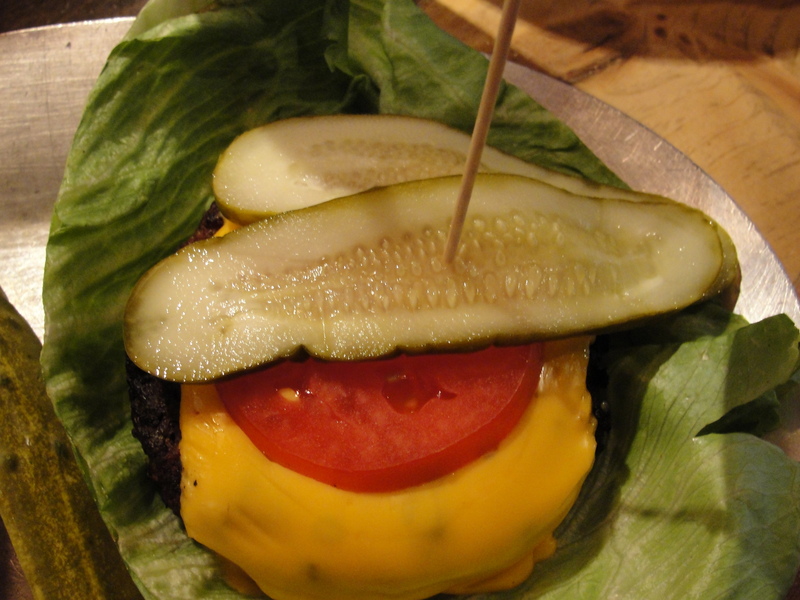 After reviewing the menu, I decided to go with the Classic Burger in a Lettuce Wrap. My burger included Americana Cheese, Tomatoes and Pickles, cooked well. The burger arrived and looked really good. The lettuce wrap wasn’t too big but, large enough to cover the burger. And man, this burger was delicious. This thing tasted like it has literally come off the grill minutes before. The taste was amazing. The grilled taste was throughout and the burger had plenty of juiciness to it – even though I had it cooked well. I loved the combination of all of the toppings with the burger as well. It was delicious from start to finish. Plus, the burger was a killer size for a reasonable price. As for my side item, I got my burger with the Baked Beans. 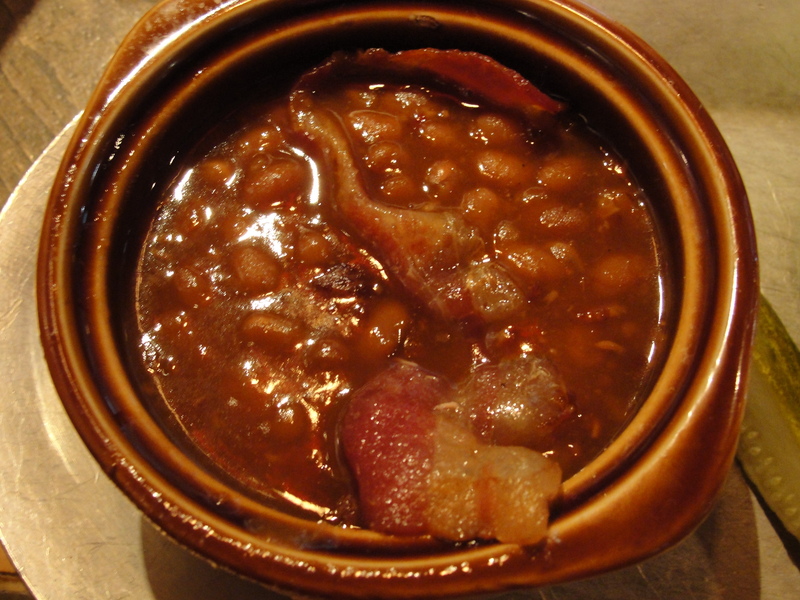 These tasted like just your basic baked beans – which is in no way a bad thing – I love baked beans. The beans had a full piece of bacon in them which I removed right away. The beans had a good flavor and were not sugary at all. They were served warm but not hot…which I much prefer. Normally, I eat baked beans cold so, anything other than hot is a good thing. I really enjoyed the combination of the baked beans flavor and the burger flavor. A nice pairing indeed. Then, we also ordered the Fry Sampler to be served with dinner. This included 3 varieties. 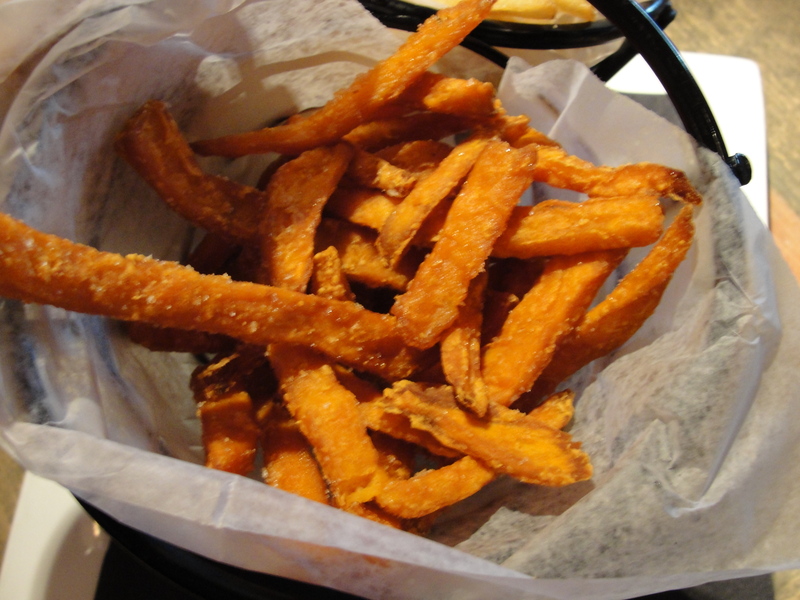 First off, the Sweet Potato Fries. These were awesome. The fries were cut big and perfectly cooked. The fries were crispy on the outside and plenty soft on the inside. I really enjoyed the slight addition of salt & pepper on these fries – there wasn’t a ton of it but plenty that made the fries just perfect. I really enjoyed these fries and would totally get them again and again. 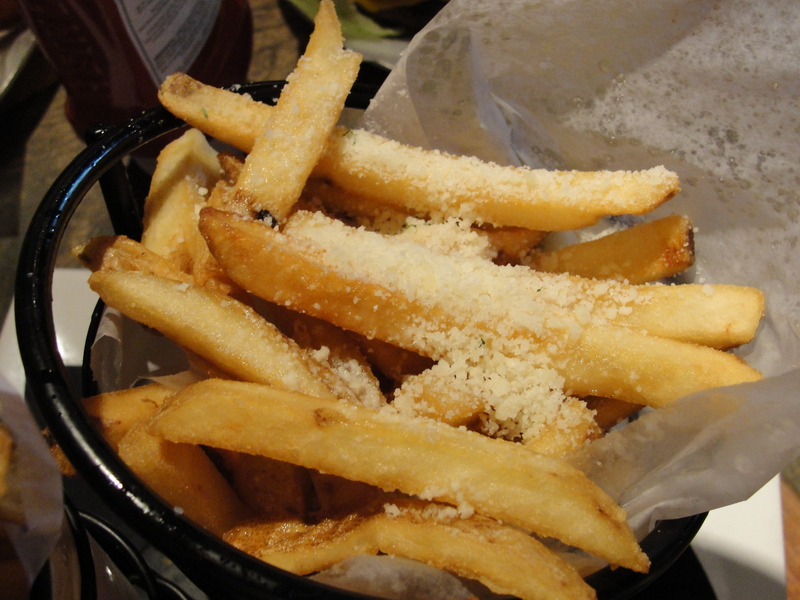 Also included were Parmesan Truffle Fries. Now to me, these tasted like they had Parmesan but I did not get any hints of the truffle oil flavor. The parmesan was very apparent and all over the fries. These were my least favorite of the three. I found the flavor to be nothing special and the parmesan, on the fries, just didn’t do it for me. The Regular Fries, our third piece, were just your basic fries. These did include some skin pieces and were also cut thick. They weren’t bad by any means but, they were just your basic fries. They didn’t do anything to amaze me. Don’t get me wrong – we ate them all – just not in a shocking way. Ford’s Garage was a fun location located just moments from the water in Downtown Ft. Myers. The location also offers a large selection of craft beers and great prices so, I can certainly see this being a hot spot. Even though we don’t frequent Downtown Ft. Myers too often, I would go out of my way to visit again that way I can stop by again. Our service wasn’t amazing but, I think we just got a dud waitress as the others, seemed to be quite attentive. When you are in the mood for some good ol’ Americana – burger and fry style – stop on into Ford’s Garage. You will love the burgers and the to-die-for sweet potato fries.